On our last visit to Derby in December last year it was the Wet Season and very hot and with the risk of a torrential storm. For this reason we made it a day trip and we did not consider overnighting in the bush. 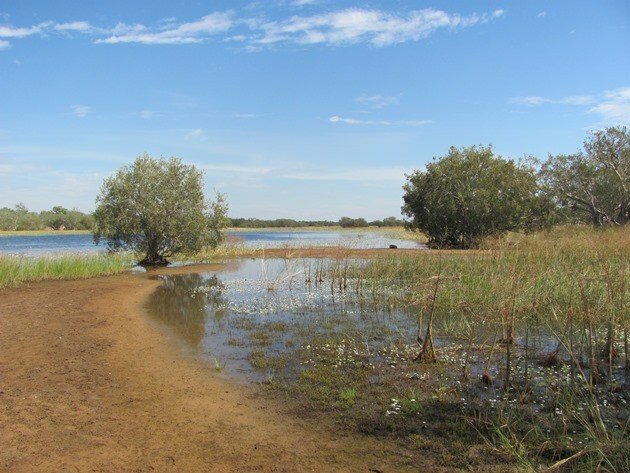 Now it is perfect weather for camping in the bush and enjoying the wildlife and for this reason we took two days to explore the bush between Broome and Derby. We first started to explore just beyond the bush track that we had explored the week before. It was rather odd that there had just been a cloudy day and even a small amount of rain had fallen in the area, missing all registering rain gauges! We headed off down another track to see what we could find in an area that we knew sometimes had water remaining from the Wet Season. One species we are more likely to find in this area than others is the Varied Sittella. It is never guaranteed of course, but there’s a better than average chance among the particular native trees. We were lucky and we did hear and then see four Varied Sittellas. They were a lot more cooperative than usual at being in one area for more than a few seconds. Several photographs later and they were flitting through the trees in search of more food. They remind us of the Nuthatches and their antics among the foliage! There was still a small body of water remaining and among the reeds were Grey Teal, Hardheads, Pacific Black Ducks and Australasian Grebe. 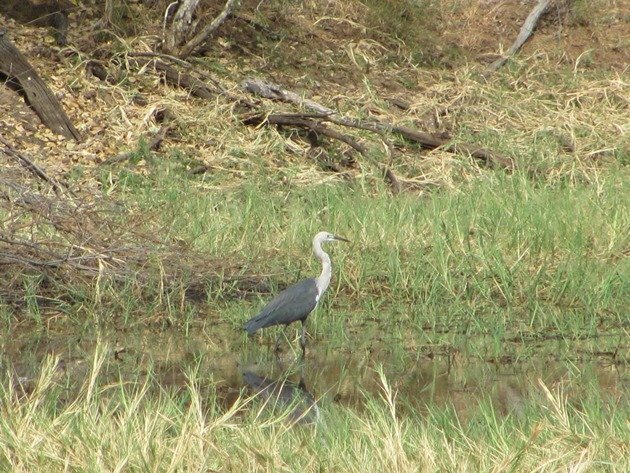 A White-necked Heron was quite well hidden in the taller reeds and several Brolga wandered in to get a drink. One lone Little Pied Cormorant was feeding and several Black-fronted Dotterel lined the muddy edges. The native bushes were full of Zebra Finch, Long-tailed Finch and Double-barred Finch waiting to nip to the water when they felt safe to do so. Striated Pardalotes were constantly calling and the Masked Lapwings soon alerted everything to our presence. As we wandered slowly around the water body we had the weather on our side. The rather heavy clouds were enough to convince a Spotless Crake to nip out from the reeds! Twice it came running out and back, but sadly we were not quick enough with a camera to record the special moment! We wandered back to our vehicle with the trees producing Yellow-tinted Honeyeaters, Rufous-throated Honeyeaters, Rufous Whistler, Peaceful Doves and the plaintive call of the Horsfield’s Bronze-Cuckoo. The smallest bushes were shrill with the sound of Variegated Fairywrens as they warned each other of our presence and flitted about flashing their blue tail feathers. Our next stop was a track we had seen before, but never ventured down. 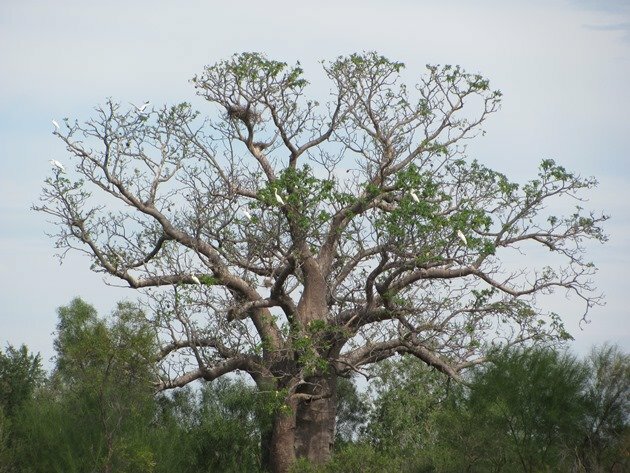 It was an area that appeared to have taller trees than normal for the area and indicated that there should be water at some time of year to enable this to happen. As we approached the area where there may be water we encountered White-winged Trillers, Grey Shrike-thrush, Diamond Doves and a Blue-winged Kookaburra. It was a correct assumption that the taller trees could mean water and we were delighted to see that there was still some water present, even though it was shallow. Although there were not a lot of individual species there was a great variety. You question how there can be one lone Purple Swamphen in the middle of nowhere! However, there was a lone White-necked Heron, a lone Whiskered Tern, a lone Little Egret and a lone Little Pied Cormorant! There were several Eastern Great Egrets, Intermediate Egrets, Australian White Ibis, Glossy Ibis, Straw-necked Ibis, Pacific Black Ducks and Australasian Grebes. No doubt they will all be relocating as the water dries out over coming weeks. Heading further along the highway towards Derby we stopped at Cockatoo Creek to see what was around the bridge area. The water level was higher than we normally expect at this time of year and it meant that there were no small mud islands for the Freshwater Crocodiles and they had to line the bank. 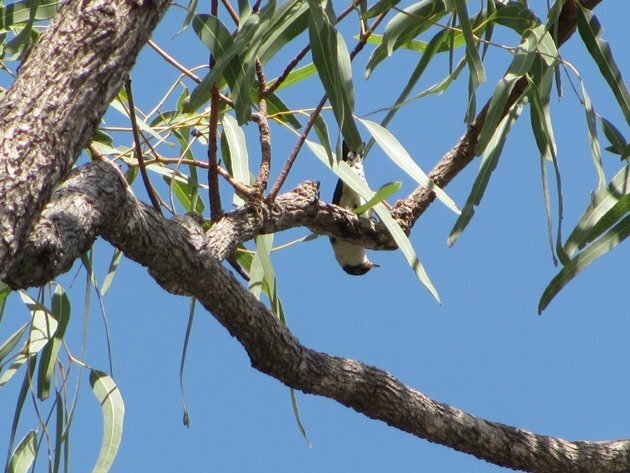 The native trees around the bridge were in flower and a good place to find Black-chinned Honeyeaters, Yellow-tinted Honeyeaters and Paperbark Flycatchers. There were a good variety of birds around the water body and the highlight was our first Black-necked Stork for the year due to our time away for a good part of the year so far. It had been at the water’s edge and was having a good scratch and shake when it appeared in our vision! 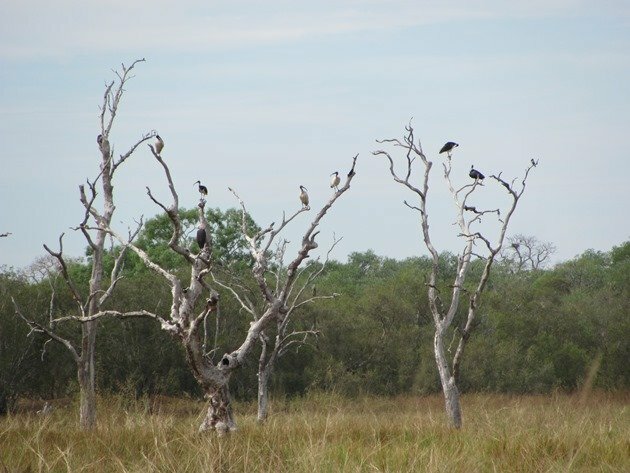 We like to camp in the bush about 60 kilometres south of Derby, because there is fresh water, tall trees and excellent bird-watching opportunities. Just as we were about to turn down a track we noticed that the track on the opposite side of the road was active! As you can see the land is already dry and dusty and the grass is highly combustible. In fact the edges beside the highway are being burned to give vehicles more vision beyond the long dry grass as cattle wander freely across the northern parts of Western Australia. Out of the long dry grass came two, then three and finally six Brown Quail! Brown Quail are a species that you usually flush by accident as you head through the long dry grass. They fly up and then fly down and run and that is the last you see of them. 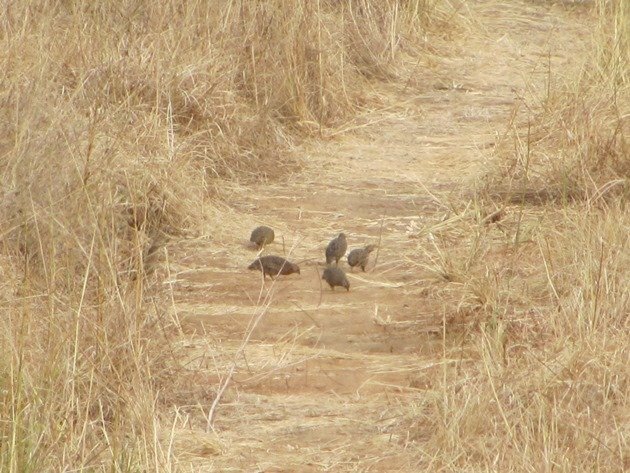 This time the Brown Quail moved to the middle of the track and took a dust bath! I was able to take photographs through the vehicle and across some distance and this is a species I had never expected to photograph at all. 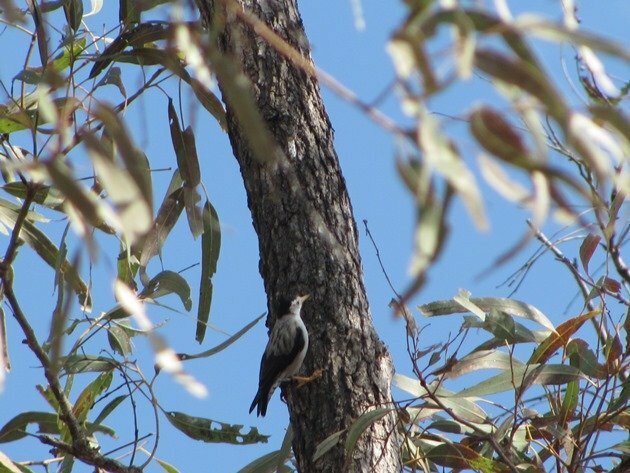 Our bush camp was far from quiet, but we know that Australian birds are not quiet species! The noisier species at the place we chose to set up our tent were Red-tailed Black Cockatoos, Galahs, Red-collared Lorikeets, Little Corellas, Redwing Parrots, Paperbark Flycatchers, White-gaped Honeyeaters, Grey-crowned Babblers and Torresian Crows! The more subtle species were White-bellied Cuckoo-shrikes, White-throated Honeyeaters and Bar-shouldered Doves. The final racket came from at least six Blue-winged Kookaburras determined to have the last call well after sunset! Quiet prevailed for a short while and then the Southern Boobooks, Barking Owls and Bush Stone-curlew started up! Oh, the peace and tranquillity of the Australian bush! Love it!!! We continued on towards Derby the following morning after being woken by the bird-life early and once again returned to the ephemeral lake that we visited last December. We were now able to drive all the way in and park in the shade and then go for a walk. 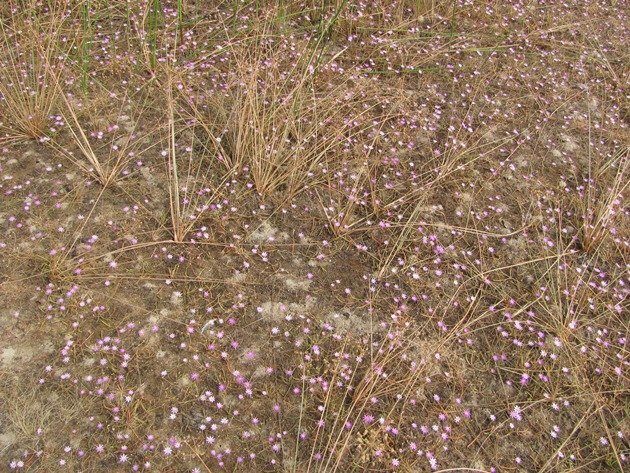 As the water recedes the land is alive with pink native flowers and small white flowers, which we believe eat insects, line the edge of the lake. 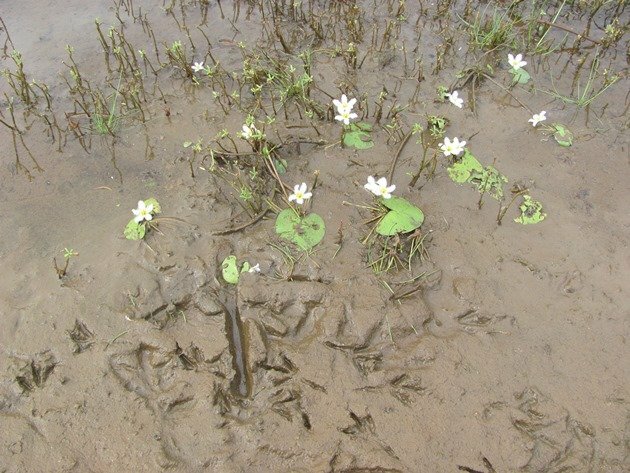 Birds have left their prints all along the edges of the lake and you can see the huge variety in footprint size! The lake is still teeming with bird-life, but it is a different variety from December. There were no Black-winged Stilt, Red-kneed Dotterels or Whiskered Terns present on this visit. Plumed Whistling-Ducks have been replaced with Wandering Whistling-Ducks and there are large numbers of Eurasian Coots. Once again we discover one lone Purple Swamphen! As we wander the edges of the lake we keep to the bushes and use them as camouflage. We scan through the waterbirds looking for anything obscure and discover four Green Pygmy-geese floating among the ducks. 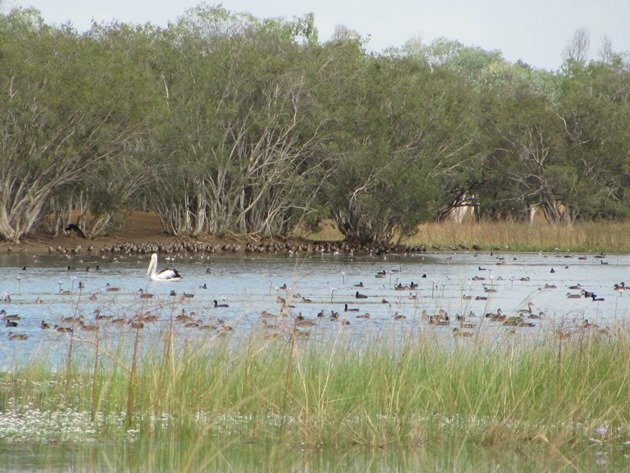 A few Australian Pratincole swoop down over the water and Brolga land further away. The weather is warm, but it is dry and the birds show the difference visibly. 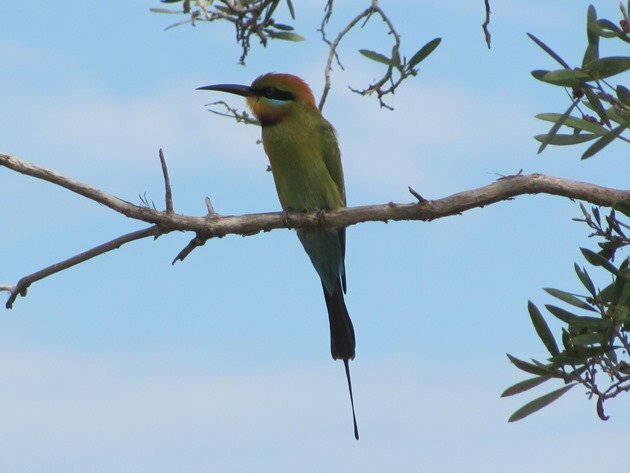 Looking back at December and how hot we were and how hot the Rainbow Bee-eaters were it is a completely different environment! Even their plumage looks smarter, as do we in our clothing not dripping with sweat! Eventually we are guided around the edge of the water to circumnavigate the water body. 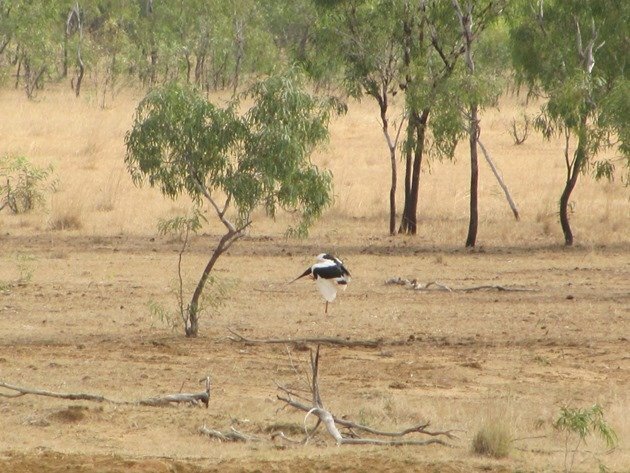 The reeds make it deceiving to work out where is dry and where is still flooded, but a dead tree that is a roost to Straw-necked Ibis, Australasian White Ibis and a White-necked Heron confirms that there is still water around that area! We flush a Rufous Songlark from the grassy area, which is a good find. Although they have a wide range and you think you should come across them fairly often when you look at their range and habitat they do tend to elude us! 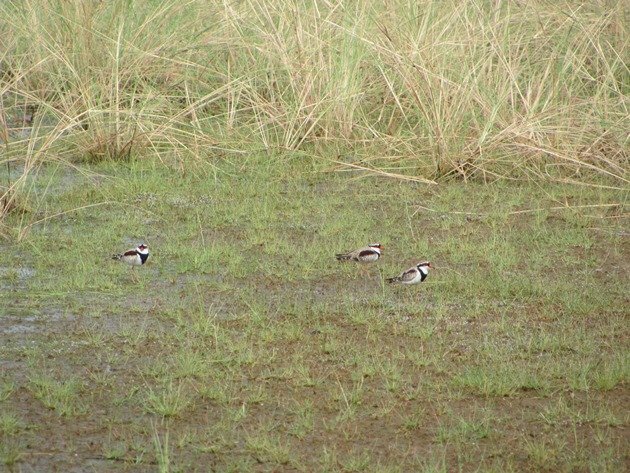 There’s a bit of a face-off with three Black-fronted Dotterels, so we give them a wide berth and head across to the other side of the water! We have found them nesting here in the past and respect their territory. On the other side of the lake we are constantly listening to the call of the White-throated Gerygone, which sounds like a little musical waterfall. They are feeding in the trees all around us and after several attempts of photographing them I can’t show you their “white throats”, but I can show you their “yellow rumps”!! We can just rename them “Yellow-rumped Gerygones” for the purpose of this post! 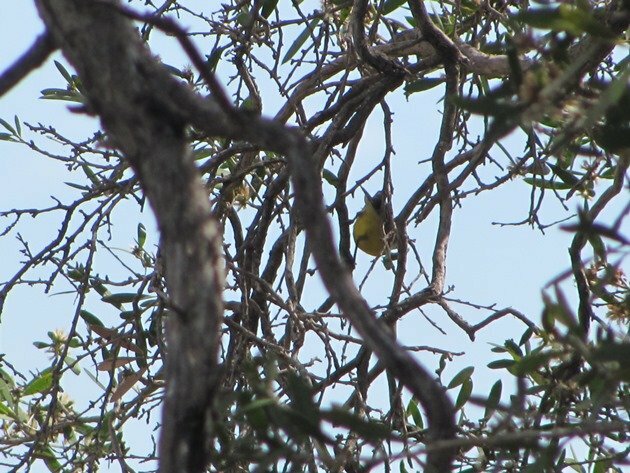 Also these Gerygones were previously known as “warblers” for those of you who are “warbler” fans!! As we return to our vehicle we discover a Black-necked Stork has arrived and is among the reeds with several Glossy Ibis. Golden-headed Cisticola call out their presence and come to the top of the reeds and we continue our journey towards Derby. A brief stop at the Derby Poo Ponds (waste-water treatment plant) provides one Royal Spoonbill, several Black-winged Stilts and Plumed Whistling-Ducks. There are huge numbers of Black Kites due to the proximity of the rubbish tip and several Torresian Crows. The tide is racing back in as we reach the wharf and we notice one large Saltwater Crocodile coming in with the tide. One lone Whimbrel is feeding along the edge and several Eastern Reef Egrets of both grey and white morph. The power lines are a good roost for a Sacred Kingfisher and several White-breasted Woodswallows. We head back out of Derby to get home before dark and we are surprised to see once again a lone Purple Swamphen! That is three lone birds that are a huge distance apart, but as the land dries out they may all meet up at the last remaining water! They are not small birds that you can overlook and being “blue” is not the best camouflage in the bush! We only made one brief stop on the way home and that was to check out Cockatoo Lagoon once more and there was a Dingo leaving after having a drink late in the day. 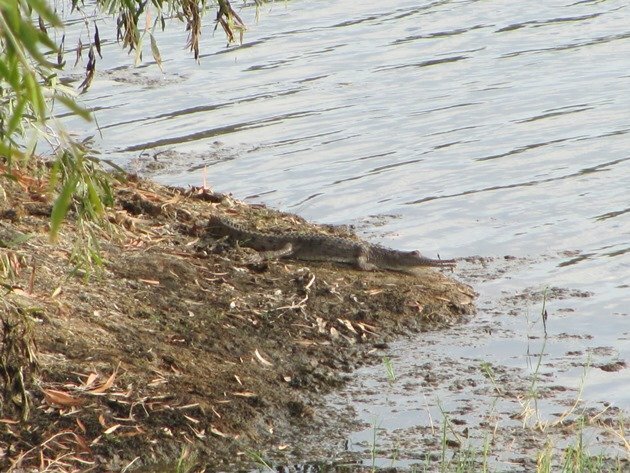 The Freshwater Crocodiles were lining the bank and the birds were making their last trips to the water in the fading light. 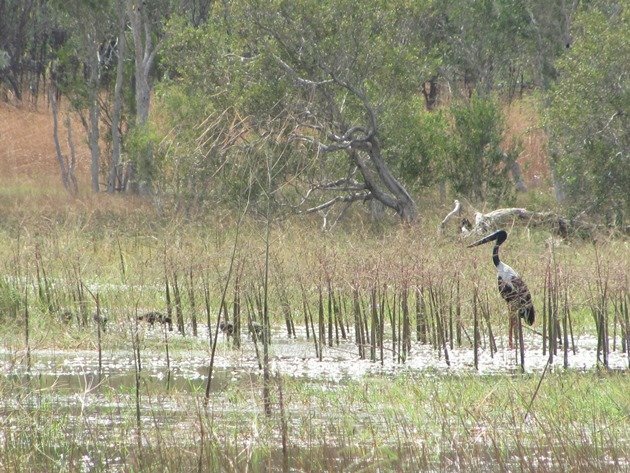 Whether you are travelling between Broome and Derby in a few hours or taking your time you are guaranteed to encounter some great bird-life, but the longer you have the more you will see. Don’t be afraid to wander a few tracks, but be aware that it is a harsh dry country and you need to be self-sufficient. Don’t expect your phone to work and you may not encounter much traffic, so be sensible and don’t get lost in the bush! Wow, I can almost hear that lovely bird racket, Clare! What a wonderful outing you had – so much variety. Love the wildflowers, too. Thank you! Audubon to No Longer Own Hog Island?